Hey all- I’m Zach Rivers, a L2 from Saint Paul, Minnesota, and one of your new Area Captains. While we’re still in the process of ironing out exactly how Ken Bearl and I will share the Metro area, I’m going to start off my blogging for the region. As the title says, I consider myself a jack of all trades when it comes to both playing, and judging, as I work hard to balance scorekeeping, judging, and playing at Competitive REL events. My goal for this series is to share insights that I’ve gained from my experiences, highlight areas for improvement in my techniques and our community, and help other judges achieve good balance in their Magic and non-Magic lives. 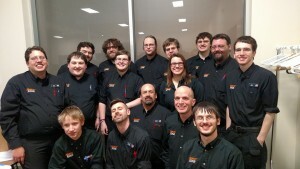 My first post is a tournament report from SCG Regionals, hosted at Fantasy Flight Games in Roseville, MN. When I’m approaching any tournament with multiple judges, I have a number of goals I try to accomplish before the event. I reach out to my team lead, or head judge if I’m a team lead, to touch base and make sure that I understand their goals for me, my team, and the event. I also like to reach out to my team members, especially if I haven’t worked with them before. This lets me identify opportunities for me to mentor new judges, or find positive learning opportunities for myself. Finally, I refresh myself on the IPG/MTR, especially if I’m scorekeeping, and double check the format guide on the Judge Wiki to make sure I’m up to date on all the nuances of the format. Here’s my report for the day, so you can see how I approached the event, and hopefully gain an appreciation for the importance of self-reflection after the event. I’ll chime back in at the end to chat more about the importance of tournament reports and reflection! When I showed up, we had already hit our pre-reg cap of 200, and there were plenty more players looking to get into the tournament. We ended up adding on seats to the hall to get to 310, but still had to turn away a significant number of players. As we reached our limit, there were a number of well-known players who hadn’t pre-registered, that expected us to bend the rules to let them in to the tournament, but the TO and I agreed that it was important for us to not make exceptions based on names. This led to some hurt feelings, but hopefully we were able to communicate effectively with them. For the players meeting, we didn’t have a printer that was up and running, as we had switched from the permanent desktop to the TO’s laptop, as he had downloaded the player list already. We were able to scroll them, and eventually got our printer on line, but it was going to be a hectic day. As we got the first round up and going, I was already being inundated with questions about when our IQ was going to fire, how much it cost, and when I would be able to answer the questions I didn’t know the answer to. The first three rounds involved this, as we had players that were frustrated they weren’t able to play in regionals, and it made it hard to focus on answering questions about the tournament I was scorekeeping, as well as fixing issues that came up. The first big issue of the day came up during round 4, when a player signed the match slip, and his opponent checked the wrong drop box. A judge who didn’t confirm the result picked the slip up, and the result was entered as it read. During round 5, the player who was dropped approached me, and indicated that he didn’t intend to drop. However, the head judge had already started the round, so he was given the bye as to not disrupt the tournament. Nothing came of this until the start of round 6, when this same player, as well as another, approached me to say that they had been dropped. The new player was dropped inadvertently, but fortunately, both players had the same number of points, and hadn’t been paired previously. As I re-enrolled them, the first player for the second time, WER unpaired the entire tournament. I had retained a copy of the pairings that were printed, but spent the entire round repairing the tournament by hand. Additionally, we were finally firing the IQ, so I was feeling a bit overwhelmed at this point. After a 20 minute or so delay at the end of the round, as each slip had to be entered differently than it was printed, as the top player on the slip wasn’t the top player in WER. I apologized to the tournament for the delay, but players seemed to understand. I did ask all players to double check their points, to ensure that I didn’t make any mistakes, and the head judge asked them twice during is start of round announcements. That’s three separate announcements about point totals, but I’m not foreshadowing or anything. The rest of the tournament went smoothly, up until the final cut. I had a player approach me, and ask me why his points were wrong. We pulled his match slip for the last round, and he and his opponent had filled it out wrong. Fortunately, we were able to track down his opponent, and got them switched. The player from round 4 had 15 points, when he won five matches and had the bye, which was confusing. We determined that WER did not have him existing in the tournament during round 5, and no matter what I did, I was unable to give him his points. I reached out to my scorekeeping contacts, and they had no solutions either. We looked to see where he would have fallen in the 18 pointers with respect to tiebreakers, and he wouldn’t have cashed, but he was very frustrated with my “ineptness”. It was an important opportunity for me to stand my ground and calmly assert the facts of the situation, and eventually he agreed that he had signed the slip during round 4, and did not check his points during rounds 7, 8, or 9, when a fix may have been possible. Looking back at the event from the next day, I wish I had communicated better with the TO. I wish that we had done registration away from the scorekeeper’s station, and that there was a store employee that was able to field the questions about the IQ and other side events. I felt overwhelmed trying to placate frustrated players while working to scorekeep the tournament. I learned a great deal about fixing issues that came up during tournaments, as well as the importance of following “problems” forward, to ensure that my fix actually worked. Overall, this was a great experience for me. I gained confidence in my abilities, and feel more comfortable working with 300-400 person tournaments. I should also work on being less surly during the early rounds, but with how this event started, I felt like I was set up for failure in that regards. I’m hopeful that with better communication between the TO and myself, and a better understanding of both of our needs at the start of the tournament, I’ll be able to improve on this. So that was an adventure, huh? When approaching the time after tournament, it’s important to remember the goals you had for the day for yourself, your team, and the ones that were given to you by your head judge or team lead. My goals for the day, which didn’t come out as strongly in the report as I may have hoped, were to spend less than 3 minutes in between the last slip in, and the pairings for the next round being posted on paper, and to not make any errors while entering results. Other than the round that I had to manually repair, I accomplished my first goal, but struggled a bit with my second. There were 4 instances over the 9 rounds of regionals and 6 rounds of the IQ that I had to make a change, but two of them were due to improperly filled out match slips. 2 errors out of the entire tournament wasn’t much, but I had hoped to do better. My final goal was to work on the reputation I have as a surly scorekeeper, and I was doing great until the break in round 5. So to wrap things up, when approaching a tournament of any size, it’s important to identify your goals prior to the event, work on keeping track of them during the course of the event, and reflect on them soon after the event is over. This allows you to continue to grow and develop as a judge, scorekeeper, and as a player. Documenting and reflecting allows you to track how you’ve grown and changed, and identify where you still have room to better yourself. Stay tuned for the next post, when I talk about how to balance playing and judging at your local store!